Palestinian Prime Minister Fayyad Resigns Post : The Two-Way Salam Fayyad's exit ends a power struggle with President Mahmoud Abbas that rose to new heights in recent months. Fayyad had reportedly tried to quit his job earlier this week; Abbas initially refused it, but he finally accepted the resignation Saturday. 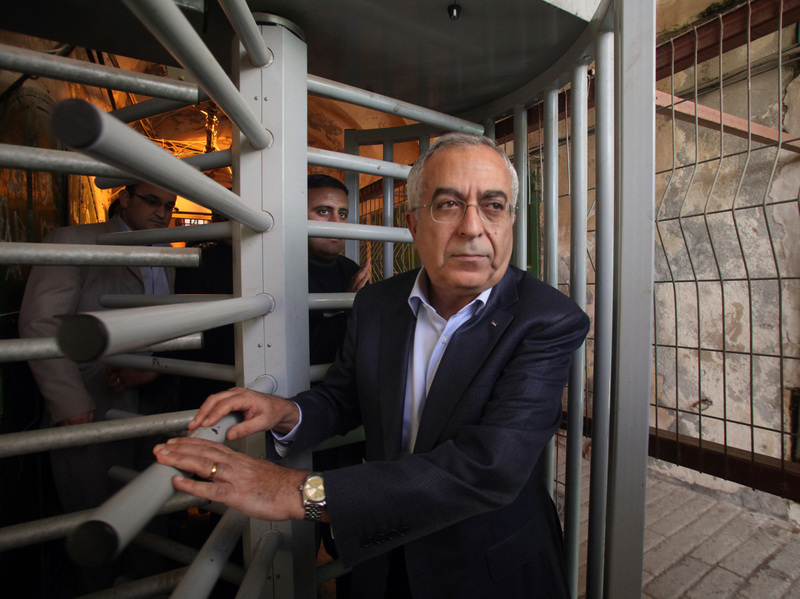 Salam Fayyad passes through an Israeli checkpoint in the West Bank town of Hebron in January. This week, he resigned from his post as prime minister of the Palestinian Authority. Palestinian Prime Minister Salam Fayyad has resigned, ending a power struggle with President Mahmoud Abbas that rose to new heights in recent months. Fayyad had reportedly tried to quit his job earlier this week; Abbas initially refused it, but he finally accepted the resignation Saturday. Fayyad, who as the AP reports "enjoys the support of the international community, particularly the United States," had been in the post since 2007. He will remain in the job until Abbas names a replacement, something that could occur within days. The exit of Fayyad, an economist who is viewed as a moderate, comes as the U.S. government attempts to restart negotiations between Palestinians and Israelis. Secretary of State John Kerry met with Fayyad during his visit to Jerusalem last week. In an interview with NPR's Guy Raz for Weekend All Things Considered last December, Fayyad said that the process of moving toward a peace accord has been "a story of disappointment." While the relationship between Fayyad and Abbas was never an easy one, things turned especially sour in March, when Finance Minister Nabil Kassis tried to quit. "Mr Fayyad accepted Mr Kassis's resignation, but he was subsequently overruled by Mr Abbas," the BBC reports, "effectively challenging the prime minister's authority to hire and fire Cabinet ministers."